Six hours, 8 hours, maybe even a full day: this is how long people say the batteries last in their phones. Why do some batteries last longer than others, and how do batteries work? As descriptive as Mary’s explanation is, it isn’t close to reality. 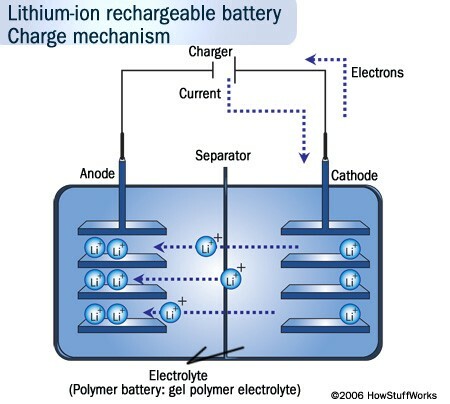 During charging, lithium ions (the blue circles in the diagram below) flow from the positive electrode to the negative electrode through the electrolyte/separator. Electrons also flow from the positive electrode to the negative electrode, but take the longer path around the outer circuit. The electrons and ions combine at the negative electrode and deposit lithium there. During discharging, the ions flow back through the electrolyte from the negative electrode to the positive electrode. Electrons flow from the negative electrode to the positive electrode through the outer circuit, powering your phone. When the ions and electrons combine at the positive electrode, lithium is deposited there. The chemical reaction moves the electron, which then becomes electrical energy. When all the ions have moved back, the battery is fully discharged and needs charging up again. 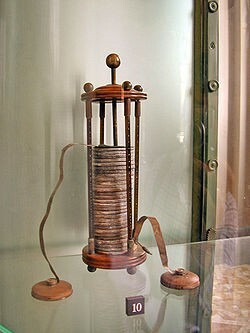 Developed in the early 1800s by Alessandro Volta, the Voltaic Pile, was the first battery which continuously provided electrical current to a circuit. The Voltaic Pile consisted of pairs of copper and zinc discs piled on top of each other, separated by a layer of cloth or cardboard soaked in brine. This battery produced a continuous and stable current and lost little charge over time when not in use. Although Volta’s early models could not produce a voltage strong enough to produce sparks, he experimented with various metals and found that zinc and silver gave the best results. A model of Volta’s early battery. Randy Brown, the physics guru, explained “The pump is the best analogy to represent a battery, a battery is an electron pump.” A pump is like a battery because both of them transfer water or electricity to another place. In just a few hundred years the battery has changed your life by supplying you with a portable power source. Maybe that explains Mary Bashaw’s energy.